← Mis-Adventure in Picketwire Canyon . . . The Movie! Is Adventure Travel Right for You? Dictionary.com defines adventure travel as a “vacation or trip to a natural environment or remote location with the specific purpose of active physical participation and exploration of a new experience” (the bolding is mine for emphasis). I’m going to be honest here – adventure travel is not for everyone. Adventure travel is not a cruise or a 5 star vacation where you eat gobs of decadent food, sleep in comfortable beds, and are pampered every waking minute. 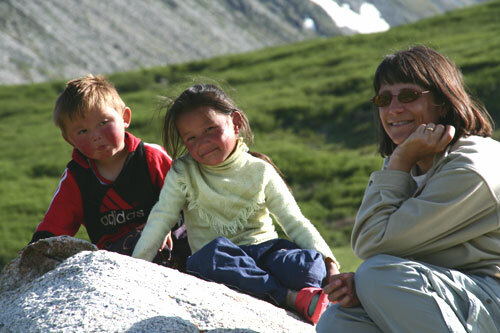 Adventure travel often involves some discomfort and certainly unfamiliar situations. We’ve sat on the side of a mountain in a snow storm, huddled under a space blanket for warmth, waiting for our less-than-cooperative pack camel to climb the mountain with our camping gear and warm clothes. We’ve taken down camp in a 60 mph wind storm with poor visibility and volcanic sand blowing into every part of our exposed faces. I’ve camped and hiked for two weeks in the wilds of eastern Russia without my baggage or any of my gear because the airline misplaced it. 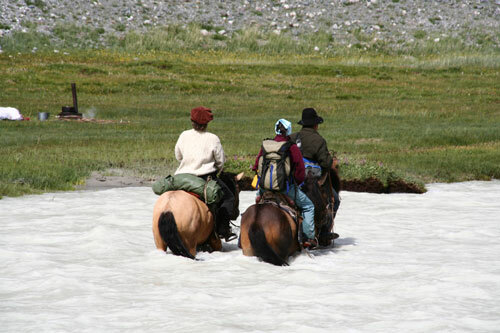 We’ve crossed a raging, milky glacial river on horseback just minutes after our guide told us that they never take customers across the river on horseback because it is too dangerous. But when your van drives for hours up the wrong side of the river, what else can you do? I made fast friends with more than a dozen little Nepali girls after I gave them all some hand lotion to try – they loved the smell and the way it felt on their hands. They didn’t leave my side the entire time I was in their village. We’ve been the honored guests at the Mongolian Naadam Festival. 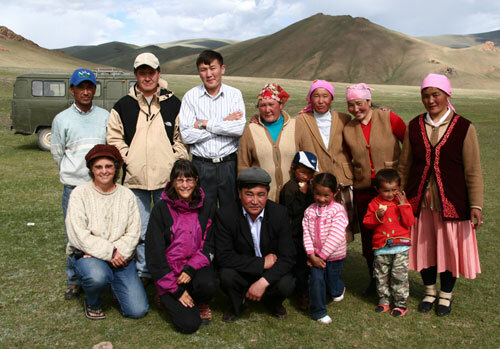 We watched their wrestling matches and horse races and then shared boiled mutton and homemade vodka with the local dignitaries. In Tanzania, I sat around a fire and talked with a Masai chief and then was invited into his home to see how they ingeniously build their huts to keep the flies out. An old woman lovingly poured cool water on my head when I nearly passed out from heat-stroke while hiking on the Great Wall of China. 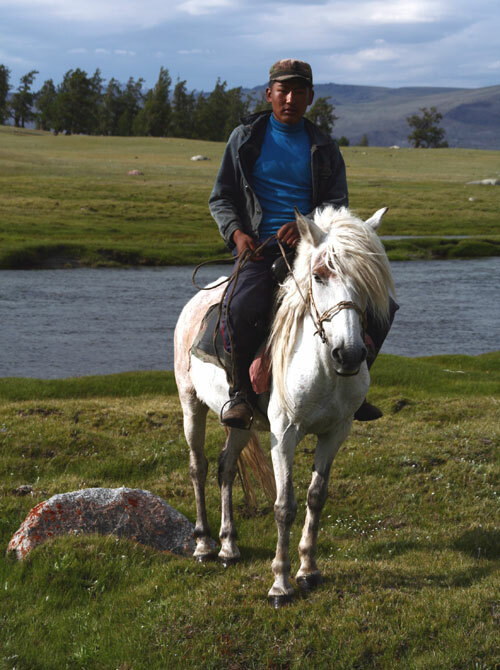 While photographing the scenery, a young Mongolian man proudly rode his white horse across the field to me and asked that I take his picture on his horse. He then offered me a ride on his horse. I’ve stood at 19,340 feet above sea level when I summited Mt. Kilimanjaro, my highest elevation ever, and I’ve seen Mt. Everest. We’ve walked into the crater of an active volcano. We’ve looked into the eyes of giant, endangered sea turtles and swam alongside whale sharks. 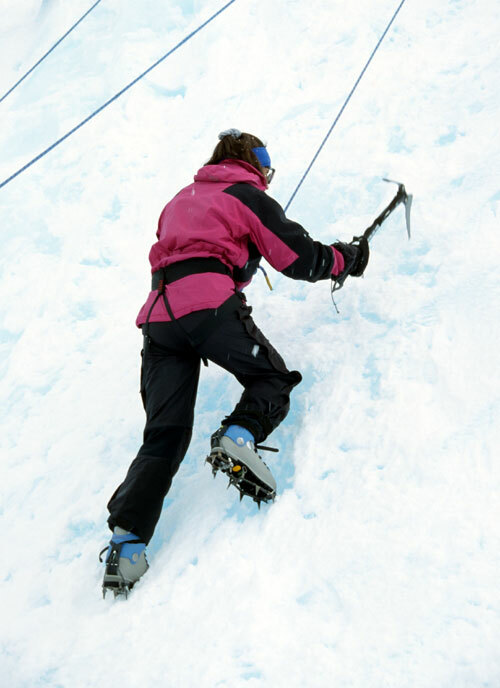 We’ve been ice climbing on an iceberg in Antarctica. Good or bad, all of these experiences have made me who I am. I believe they have made me more open-minded, understanding, patient, thankful, and compassionate, as well as made me more confident in my ability to accomplish great things by pushing myself physically. And they all make for great stories. Food: The rest of the world does not eat what you eat and they often have different customs about when they eat. For example, in Russia, they generally do not eat lunch until 2:00 pm. If you are a strict vegetarian, carefully research where you will be traveling because being a vegetarian in some parts of the world is not practicable (especially in places like Mongolia and Russia). In these cases, consider bringing some of your own food if this will be a problem. Transportation: The vehicles you may spend long hours in probably won’t have air conditioning, the heater may not work, and they will certainly break down multiple times. And you may be traveling extended distances on rough, unpaved roads. Dress accordingly and bring your patience. Sleeping Arrangements: If you will be sleeping in tents, it may be hot or cold so dress accordingly and bring appropriate sleeping gear. I highly recommend that you bring your own sleeping bag and sleeping pad as the ones that you can rent from outfitters may not be high quality, warm, or in the case of pads, very thick (i.e. the one I slept on in Russia was nicknamed the “pad of pain”). You get the point. Hotel accommodations in these places probably won’t be what you are used to either. You may have to use communal facilities; to avoid drenching the bathroom, you may have to sit in the bathtub while using the hand sprayer for your shower; and rooms almost never have double (or queen or king) beds. Even in Europe, rooms for couples generally have two single beds. Weather: The weather is the weather and you have no control whatsoever over what you encounter. Bring lots of layers and just deal with it. Sanitary Conditions: Many places of the world still use holes in the ground for toilets and have no running water. Bring your own toilet paper and hand sanitizer and once again, just deal with it. Itinerary: It’s pretty much guaranteed that some part of your itinerary will change or be rearranged at the last-minute due to a myriad of reasons: weather, availability of supplies, or transportation issues. You need to trust your local guide and here is another circumstance where you’re just going to have to remain flexible and deal with it. If you are the kind of person who cannot keep your mouth shut when encountering difficult situations, you should not go on an adventure trip – your complaining will ruin your travel companions’ vacations. No one wants to be around a whiner and complainer. And finally, as someone who loves adventure travel and meeting new people the world over, please remember that you are visiting someone else’s country. You are a guest there and you should respect the people and their customs. Additionally, you are an ambassador for our country. How you act when abroad reflects on our country and all of us – please don’t give the rest of the world another reason to believe that all Americans are spoiled, rich brats. A smile and thank you in the country’s native tongue go a long way. I have a passion for adventure travel that began in 1989 with my first overseas trip: climbing Mt. Kilimanjaro in Tanzania. Having never been to a foreign country, Africa felt like being on another planet; I knew then and there I was hooked on travel. Since that time, I have visited all seven continents and dozens of countries. I’m using the experience I’ve gained in planning my own trips to help my clients plan their own adventures through my adventure travel company (http://www.offtrailtravel.com). After working as a firefighter for the US Forest Service in California and Wyoming for three years, I moved to Durango, Colorado where I graduated from Fort Lewis College with a degree in accounting. After graduation I moved to the Denver area where I worked in a Big Eight accounting firm to obtain my CPA license; soon afterward I began a career as an auditor with the Colorado Department of Education. My background in accounting helped me develop detailed-oriented skills that have been extremely useful in researching and planning my own travel over the years. I think this provides a unique asset to my clients in putting together their adventure travel plans. I currently live in Golden, Colorado with my wife Valerie, who shares my love of adventure travel. I’m an active member of the Colorado Mountain Club where I lead trips for club members and have taught ski lessons in their Telemark Ski School. I enjoy skiing, mountain hiking, trail running, photography, and astronomy. I take any opportunity I can get to explore new places, whether it’s on the other side of the world or just down the road. This entry was posted in International Travel, Travel Inspiration, Travel Tips and tagged Adventure Travel, adventure travel tips, benefits of travel, food, gracious travelers, is adventure travel right for you, itinerary, sanitary conditions, sleeping arrangements, transportation, weather. Bookmark the permalink. 2 Responses to Is Adventure Travel Right for You? I fond your post , searching travelers guide in Google , 10x for good post. Off Trail Travel: Let us plan your next adventure!